In-Touch is a system for managing communications that need putting in place for all activities in Scouting. It differs from the old Home Contact Scheme in that it allows you to put in place the systems that are most effective for your event, rather than following the same specific system for every type of event. As such there is no requirement for a third-party ‘Home Contact’ every time you take part in an activity, although this could still be an option that you choose to use. In-Touch also recognises that the reasons for having an effective communication system are just as relevant for a weekly meeting as they are for a camp or any other activity. Therefore, In-Touch is a requirement for all Scouting events, including programmes at the Scout Centre. This doesn’t mean lots of work in setting up new systems every week. The adoption of “In Touch” is based on the concept of best practice and reasonably foreseeable risk. For 4th Bramhall Scout Group and Sabre Explorer Scout Unit it’s simply a question of ensuring Online Scout Manager is up to date, longing on in the building and downloading an in touch document every time we leave the building as internet connection is not guaranteed when out and about. Standard risk assessments apply for all activities and events being held, an “In Touch” procedure can in most case’s be divided into two levels. Level 1 Normal weekly meetings at our HQ Building, with members of our own group, where you can be contacted via mobile or land line. Activities which replace a normal meeting such as visit to Bramhall Park, The Fire Station or attending a District event, where the participants can change very late and you are not travelling very far from home and again you can be contacted. Level 1 System Leaders maintain a list of all group members, including name, date of birth, address, any mobile number and parents contact details and have this to hand wherever you are. This can be downloaded from Online Scout Manager. Parents to be given leaders mobile numbers on a periodic basis. If leaders prefer not to give mobile numbers out, home numbers should be provided on a periodic basis, and when holding meetings/events away from The Scout Centre, the phone number of the meeting location should be provided to parents before departure. Parents are asked to only contact in an emergency and to do this to the leader’s mobile number, or the Scout Center’s phone number. We must ensure that contact details we retain are reviewed and if required updated every periodically. An email will be sent to all parents via Online Scout Manager asking them to update their profile details in My.SCOUT. Level 2 Any event involving a night or more away events involving multiple groups of scouts or young people from elsewhere. Level 2 System all of Level 1 system plus: A list of all participant details, as above (including leaders and parents), for the event is produced and kept to hand during the event. This can be downloaded from Online Scout Manager. Where appropriate, for example where you feel you will not be contactable (e.g. out of mobile range, or perhaps on the water all day), a home contact should still be used. They would be provided with a copy of the same list and their contact details given to parents. This does not affect the nights away notification which should be followed as normal. The In-Touch system does not formally require a nominated Home Contact to be appointed for most situations (some events do still require this). One of the most important benefits of Home Contacts is that we have someone, should an emergency occur, in the Group or District to help support communication during such an emergency. Emergency situations can occur at a regular weekly meeting as well as on larger events, and hence the Group still needs to be able to place someone into the position of supporting communication during such an emergency. All activities/events should have a risk assessment undertaken. Use of a Home Contact who is not related to anyone on the event, were possible, is advisable. Clear communications between Event Leaders and participants/parents aids clear running of an event. All events of over 24 hours or that involve more than one hours travel (40 miles) should use a 3rd party home contact in the home area. Emergency procedures should be in accordance with the purple card. 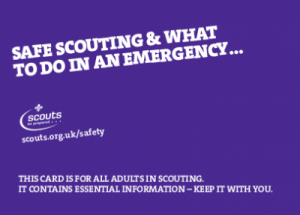 You can find out more information about the new system at www.scouts.org.uk/intouch/.